We shall now say something about the present feast of the Baptism of Christ. Many celebrate the feastdays and know their designations, but the cause for which they were established they know not. Thus concerning this, everyone knows that the present feast is called Theophany; but what this is, and whether it be one thing or another, they know not. And this is shameful every year to celebrate the feastday and not know its meaning. First of all therefore, it is necessary to say that there is not one Theophany, but two: the one actual, which already has occurred, and the second in the future, which will happen with glory at the end of the world. About this one and about the other you will hear today from Paul, who in conversing with Titus, speaks thus about the present: “The grace of God hath revealed itself, having saved all mankind, decreeing, that we reject iniquity and worldly desires, and dwell in the present age in prudence and in righteousness and piety.” And about the future: “Awaiting the blessed hope and glorious appearance of our great God and Savior Jesus Christ” (Titus 2:11-13). And a prophet speaks thus about this latter: “The sun shalt turn to darkness, and the moon to blood at first, then shalt come the great and illuminating Day of the Lord” (Joel 2:31). Why is not that day, on which the Lord was born, considered Theophany—but rather this day on which He was baptized? This present day it is, on which He was baptized and sanctified the nature of water. Because on this day all, having obtained the waters, do carry it home and keep it all year, since today the waters are sanctified. And an obvious phenomenon occurs: these waters in their essence do not spoil with the passage of time, but obtained today, for one whole year and often for two or three years, they remain unharmed and fresh, and afterwards for a long time do not stop being water, just as that obtained from the fountains. Why then is this day called Theophany? Because Christ made Himself known to all—not then when He was born, but when He was baptized. Until this time He was not known to the people. And that the people did not know Him, Who He was, listen to what John the Baptist says: “Amidst you standeth Him Whom ye know not of” (John 1:26). And is it surprising that others did not know Him, when even the Baptist did not know Him until that day? “And I—said he—knew Him not: but He that did send me to baptize with water, about this One did tell unto me: over Him that shalt see the Spirit descending and abiding upon Him, this One it is Who baptizeth in the Holy Spirit” (John 1:33). Thus from this it is evident, that there are two Theophanies, and why Christ comes at baptism and on whichever baptism He comes, about this… it is necessary to know both the one and equally the other. And first it is necessary to speak your love about the latter, so that we might learn about the former. There was a Jewish baptism, which cleansed from bodily impurities, but not to remove sins. Thus, whoever committed adultery, or decided on thievery, or who did some other kind of misdeed, it did not free him from guilt. But whoever touched the bones of the dead, whoever tasted food forbidden by the law, whoever approached from contamination, whoever consorted with lepers—that one washed, and until evening was impure, and then cleansed. “Let one wash his body in pure water”—it says in the Scriptures—“and he will be unclean until evening, and then he will be clean” (Leviticus 15:5, 22:4). This was not truly of sins or impurities, but since the Jews lacked perfection, then God, accomplishing it by means of this greater piety, prepared them by their beginnings for a precise observance of important things. Thus, Jewish cleansings did not free from sins, but only from bodily impurities. Not so with ours: it is far more sublime and it manifests a great grace, whereby it sets free from sin, it cleanses the spirit and bestows the gifts of the Spirit. And the baptism of John was far more sublime than the Jewish, but less so than ours: it was like a bridge between both baptisms, leading across itself from the first to the last. Wherefore John did not give guidance for observance of bodily purifications, but together with them he exhorted and advised to be converted from vice to good deeds and to trust in the hope of salvation and the accomplishing of good deeds, rather than in different washings and purifications by water. John did not say, “wash your clothes, wash your body, and ye will be pure,” but rather, “bear ye fruits worthy of repentance” (Matthew 3:8). Since it was more than of the Jews, but less than ours, the baptism of John did not impart the Holy Spirit and it did not grant forgiveness by grace. It gave the commandment to repent, but it was powerless to absolve sins. Wherefore John did also say: “I baptize you with water… That One however will baptize you with the Holy Spirit and with fire” (Matthew 3:11). Obviously, he did not baptize with the Spirit. But what does “with the Holy Spirit and with fire” mean? Call to mind that day, on which for the Apostles “there appeared disparate tongues like fire, and sat over each one of them” (Acts 2:3). That the baptism of John did not impart the Spirit and remission of sins is evident from the following [words of] Paul, [who] “found certain disciples, and said to them: received ye the Holy Spirit since ye have believed? They said to him: but furthermore whether it be of the Holy Spirit, we shall hear. He said to them: into what were ye baptized? They answered: into the baptism of John. Paul then said: John indeed baptized with the baptism of repentance”—repentance, but not remission of sins; for whom did he baptize? “Having proclaimed to the people, that they should believe in the One coming after him, namely, Christ Jesus… they were baptized in the Name of the Lord Jesus: and Paul laying his hands on them, the Holy Spirit came upon them” (Acts 19:1-6). Do you see, how incomplete was the baptism of John? If the one were not incomplete, would then Paul have baptized them again, and placed his hands on them? Having performed also the second, he showed the superiority of the apostolic Baptism and that the baptism of John was far less than his. Thus, from this we recognize the difference of the baptisms. Now it is necessary to say, for whom was Christ baptized and by which baptism? Neither the former, the Jewish, nor the last—ours. Whence hath He need for remission of sins, how is this possible for Him, Who hath not any sins? “Of sin,” it says in the Scriptures, “worked He not, nor was there deceit found in His mouth” (1 Peter 2:22). And further, “who of you convicteth Me of sin?” (John 8:46). And His flesh was privy to the Holy Spirit. How might this be possible, when it in the beginning was fashioned by the Holy Spirit? And so, if His flesh was privy to the Holy Spirit, and He was not subject to sins, then for whom was He baptized? But first of all it is necessary for us to recognize, by which baptism He was baptized, and then it will be clear for us. By which baptism indeed was He baptized? Not the Jewish, nor ours, nor John’s. For whom, since thou from thine own aspect of baptism dost perceive, that He was baptized not by reason of sin and not having need of the gift of the Spirit. Therefore, as we have demonstrated, this baptism was alien to the one and to the other. Hence it is evident, that He came to Jordan not for the forgiveness of sins and not for receiving the gifts of the Spirit, but so that some from those present then should not think that He came for repentance like others. Listen to how John precluded this: What he then spoke to the others then was, “Bear ye fruits worthy of repentance.” But listen to what he said to Him: “I have need to be baptized of Thee, and Thou art come to me?” (Matthew 3:8, 14). With these words he demonstrated, that Christ came to him not through that need with which people came, and that He was so far from the need to be baptized for this reason—so much more sublime and perfectly purer than Baptism itself. For whom was He baptized, if this was done not for repentance, nor for the remission of sins, nor for receiving the gifts of the Spirit? Through the other two reasons, of which the one the disciple speaks, and about the other He Himself spoke to John. Which reason of this baptism did John declare? Namely, that Christ should become known to the people, as Paul also mentions: “John therefore baptized with the baptism of repentance, so that through him they should believe on Him that cometh” (Acts 19:4). This was the consequence of the baptism. If John had gone to the home of each and, standing at the door, had spoken out for Christ and said: “He is the Son of God,” such a testimony would have been suspicious, and this deed would have been extremely perplexing. So too, if he in advocating that Christ had gone into the synagogues and witnessed to Him, this testimony of his might be suspiciously fabricated. But when all the people thronged out from all the cities to Jordan and remained on the banks of the river, and when He Himself came to be baptized and received the testimony of the Father by a voice from above and by the descent of the Spirit in the form of a dove, then the testimony of John about Him was made beyond all questioning. And since he said: “and I knew Him not” (John 1:31), his testimony put forth is trustworthy. They were kindred after the flesh between themselves, “wherefore Elizabeth, thy kinswoman, hath also conceived a son”—said the Angel to Mary about the mother of John (Luke 1: 36). If, however, the mothers were relatives, then obviously so also were their children. Thus, since they were kinsmen, in order that it should not seem that John would testify concerning Christ because of kinship, the grace of the Spirit organized it such, that John spent all his early years in the wilderness, so that it should not seem that John had declared his testimony out of friendship or some similar reason. But John, as he was instructed of God, thus also announced about Him, wherein also he did say: “and I knew Him not.” From whence didst thou find out? “He, having sent me that sayeth to baptized with water, [is] the One [Who] did tell me” What did He tell thee? 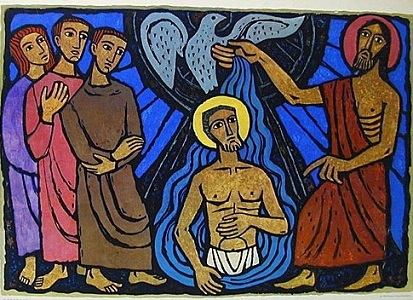 “Over Him thou shalt see the Spirit descending, like to a dove, and abiding over Him, that One is baptized by the Holy Spirit” (John 1:32-33). Dost thou see, that the Holy Spirit did not descend as in a first time then coming down upon Him, but in order to point out that preached by His inspiration—as though by a finger—it pointed Him out to all. For this reason He came to baptism. And there is a second reason, about which He Himself spoke. What exactly is it? When John said, “I have need to be baptized of Thee, and Thou art come to me?” He answered thus: “Stay now, for thus it becometh us to fulfill every righteousness” (Matthew 3:14-15). Dost thou see the meekness of the servant? Dost thou see the humility of the Master? What does He mean, “to fulfill every righteousness?” By righteousness is meant the fulfillment of all the commandments, as is said: “both were righteous, walking faultlessly in the commandments of the Lord” (Luke 1:6). Since fulfilling this righteousness was necessary for all people—but no one of them kept it or fulfilled it—Christ came then and fulfilled this righteousness. And what righteousness is there, someone will say, in being baptized? Obedience for a prophet was righteous. As Christ was circumcised, offered sacrifice, kept the Sabbath and observed the Jewish feasts, so also He added this remaining thing, that He was obedient to having been baptized by a prophet. It was the will of God, then, that all should be baptized—about which John speaks: “He having sent me to baptized with water” (John 1:33); so also Christ: “The publicans and the people do justify God, having been baptized with the baptism of John; the Pharisees and the lawyers reject the counsel of God concerning themselves, not having been baptized by him” (Luke 7:29-30). Thus, if obedience to God constitutes righteousness, and God sent John to baptize the nation, then Christ has also fulfilled this along with all the other commandments. Consider, that the commandments of the law are the main point of the two denarii. Our race needed to pay this debt; but we did not pay it, and we, falling under such an accusation, were embraced by death. Christ came, and finding us afflicted by it, paid the debt, fulfilled the necessary and seized from it those who were not able to pay. Wherefore He does not say: “It is necessary for us to do this or that,” but rather “to fulfill every righteousness.” “It is for me, being the Master,” says He, “proper to make payment for the needy.” Such was the reason for His baptism—wherefore they should see that He had fulfilled all the law—both this reason and also that, about which was spoken of before. Wherefore also the Spirit descended as a dove, because where there is reconciliation with God—there also is the dove. So also in the ark of Noah the dove brought the branch of olive—a sign of God’s love of mankind and of the cessation of the flood. And now in the form of a dove, and not in a body—this particularly deserves to be noted—the Spirit descended, announcing the universal mercy of God and showing with it, that the spiritual man needs to be gentle, simple and innocent, as Christ also says: “Except ye be converted and become as children, ye shalt not enter into the Heavenly Kingdom” (Matthew 18:3). But that ark, after the cessation of the flood, remained upon the earth; this ark, after the cessation of wrath, is taken to heaven, and now this Immaculate and Imperishable Body is situated at the right hand of the Father. Having made mention about the Body of the Lord, I shall also say a little about this, and then the conclusion of the talk. Many now will approach the Holy Table on the occasion of the feast. But some approach not with trembling, but shoving, hitting others, blazing with anger, shouting, cursing, roughing it up with their fellows with great confusion. What, tell me, art thou troubled by, my fellow? What disturbeth thee? Do urgent affairs, for certain, summon thee? At this hour art thou particularly aware that these affairs of thine that thou particularly rememberest, that thou art situated upon the earth, and dost thou think to mix about with people? 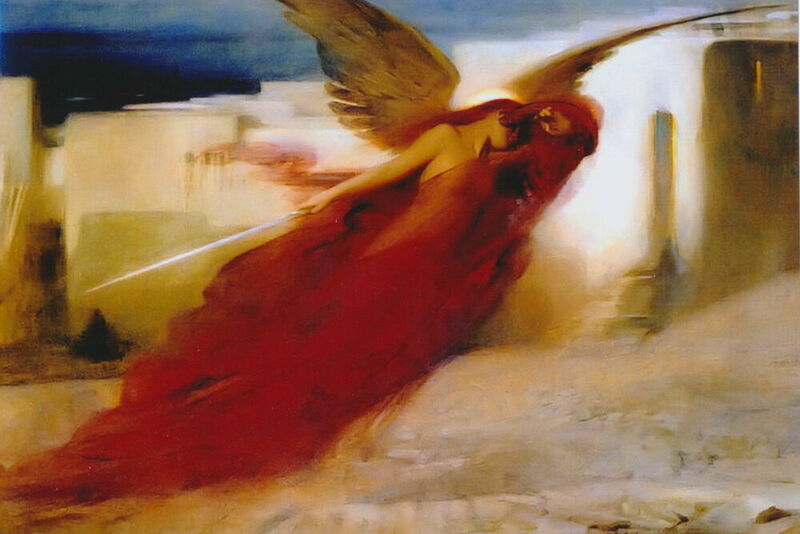 But is it not with a soul of stone naturally to think, that in such a time thou stand upon the earth, and not exult with the Angels with whom to raise up victorious song to God? For this Christ also did describe us with eagles, saying, “Where the corpse is, there are the eagles gathered” (Matthew 24:28)—so that we might have risen to heaven and soared to the heights, having ascended on the wings of the spirit. But we, like snakes, crawl upon the earth and eat dirt. Having been invited to supper, thou, although satiated before others, would not dare to leave before others while others are still reclining. But here, when the sacred doings are going on, thou at the very middle would pass by everything and leave? Is it for a worthy excuse? What excuse might it be? Judas, having communed that last evening on that final night, left hastily as all the others were still reclining. Here these also are in imitation of him, who leave before the final blessing! If he had not gone, then he would not have made the betrayal; if he did not leave his co-disciples, then he would not have perished; if he had not removed himself from the flock, then the wolf would not have seized and devoured him alone; if he had separated himself from the Pastor, then he would not have made himself the prey of wild beasts. Wherefore he (Judas) was with the Jews, and those (the apostles) went out with the Lord. Dost thou see, by what manner the final prayer after the offering of the sacrifice is accomplished? We should, beloved, stand forth for this, we should ponder this, fearful of the coming judgement for this. We should approach the Holy Sacrifice with great decorum, with proper piety, so as to merit us more of God’s benevolence, to cleanse one’s soul and to receive eternal blessings, of which may we all be worthy by the grace and love for mankind of our Lord Jesus Christ, to Whom with the Father, together with the Holy Spirit, be glory, power, and worship now and ever and unto ages of ages. Amen.